Or: How I finally became convinced all level designers working in mainstream video games need to be lined up against a wall and shot. Space Marine sums up, for me, every single thing that’s wrong with the way video games are made today, and the reason for this is that they’ve taken a concept which would be childishly easy to turn into a game that was at least moderately exciting if they showed the smallest amount of creative daring and instead created a game designed by focus group. What’s the sort of thing included in that other famous game in the same genre that sold millions of copies? That thing! Yeah! We’ll have lots of that, then, and not bother making an effort on anything else. I mean we took the piss out of that guy who accused Space Marine of ripping off Gears of War, and rightly so, but ironically his ill-informed drivel was more on the money than either he or we could have known at the time. 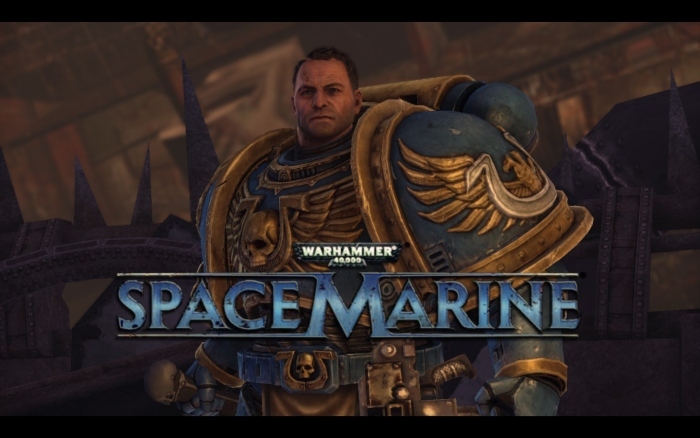 Space Marine’s main character is a Space Marine. No spoilers there, I feel. 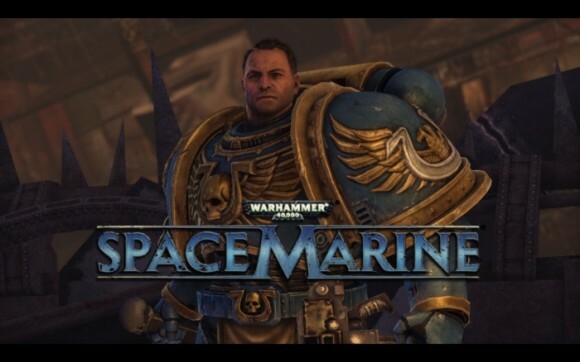 Said Space Marine is called Titus, a member of the Ultramarines chapter who is ostensibly a captain but whose company appears to consist of two guys, one of whom doesn’t like him very much. This trio of genetically-engineered blandness is called upon to liberate the forge world of… somewhere… from an Ork invasion, and they do this using an array of extremely violent and over-the-top weaponry. Now, this one paragraph tells you pretty much everything you need to know about the game. 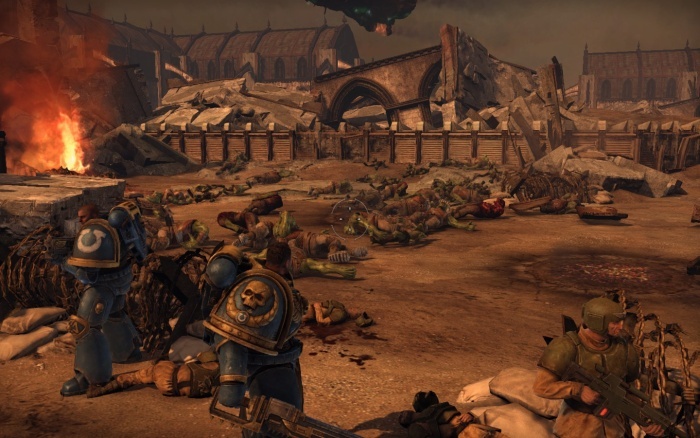 If you’re familiar with 40K and the way Gears of War-style games are put together at all, you can probably spot just from that where Space Marine has gone wrong. However, since that branch of human knowledge is, to put it diplomatically, just a little bit rarefied from the average person, I’ll break it down a bit further. The first mis-step is in using the Ultramarines as protagonists. For those who don’t know, space marines in 40k are split up into chapters which each have particular characteristics. The characteristics are a sometimes a little one-note but they do serve to inject a little bit of flavour into the universe – the Space Wolves are Space Vikings, for example, while the Blood Angels are Space Vampires and the Imperial Fists are masochistic dicks. It makes them a little more interesting than simple hulking super-soldiers in stupid armour. Not so with the Ultramarines, though. The Ultramarines are the Space Marine chapter on which all other Space Marine chapters are loosely based. Their defining feature is, quite literally, that they are generic Space Marines. There is nothing interesting about them whatsoever, besides the fact that they come in the starter box for 40K and so have the widest brand recognition. So right from the start the game falls flat on its face by giving me a squad of three generic space marines from the generic chapter with generic character traits. There’s the boring knightly captain with a flair for the unorthodox, the boring grizzled sergeant who has seen everything and done everything, and the boring new recruit who does everything by the book. It’s like they were trying to make this game as bland as humanly possible. It doesn’t even stop there. The game is set on a forge world; this is an entire planet that’s been turned into one huge industrial complex to churn out the Imperium’s weapons of war. Which fluff-wise is sort of an interesting concept, I suppose, but huge industrial complexes – imagine a giant oil refinery that goes on forever – are very dull to look at. The environments are all drab brown shell-pounded earth, grey sepulchral concrete buildings and twisted metal ruins. Worse is that there’s been no imagination shown in the architecture. The Imperium of Man is supposed to be a semi-feudal society with heavy gothic influences; an Imperial battleship resembles nothing so much as a huge floating cathedral bristling with weaponry. Fighting on a forge world should have featured buildings that looked like an insane medieval architect had been set loose with far-future building materials and technology – enormous, towering constructions with interiors that resembled ornate vaulted naves with stained-glass windows depicting the cult of the God-Emperor. Something interesting to look at,basically. Instead, I got to fight my way through a series of concrete boxes. Concrete boxes littered with other boxes in the form of crates and cargo containers along with the occasional waist-high metal barricade. There was one bit where my new Inquisitor friend opened a huge blast door to show me his secret superweapon, and I actually laughed out loud when I saw that it was a yet another series of metal walkways and gantries inside a particularly large and dimly-lit concrete box. The only sources of colour in the game are the ones which Relic had no creative control over: the bright blue armour of the Ultramarines and the garish red of the Ork flying machines. I mean, it’s hard to believe but they actually made a game that looks so dull and boring that the most visually interesting parts are those that have been lifted wholesale from the grimdark background. Even the set-piece bits of the game that should have been all pulse-pounding excitement are corrupted by this lazy visual design. There’s a bit near the end where you ride on a Warlord Titan. A Warlord Titan. Right? That’s a gigantic hundred-metre tall battle robot with guns that have the same destructive power as a small nuclear weapon. I know the mental image you have of what this encounter might have been like. It probably involves the Titan stomping over a battle-in-progress dozens of tiny green figures scurrying around beneath it and being flattened under its feet, the Warlord occasionally stopping to dispense flaming plasma death on high-value targets before firing all of its primary weapons on your objective. That would have been awesome. 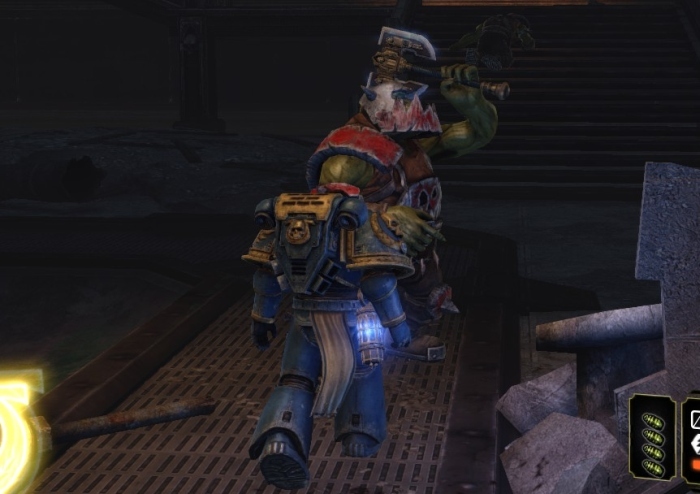 For me, that would have singlehandedly justified Space Marine’s purchase price. Now, what actually happens during this set-piece is that the Warlord is located inside a dark hangar. It trudges slowly forward inside this huge, dim, concrete box. 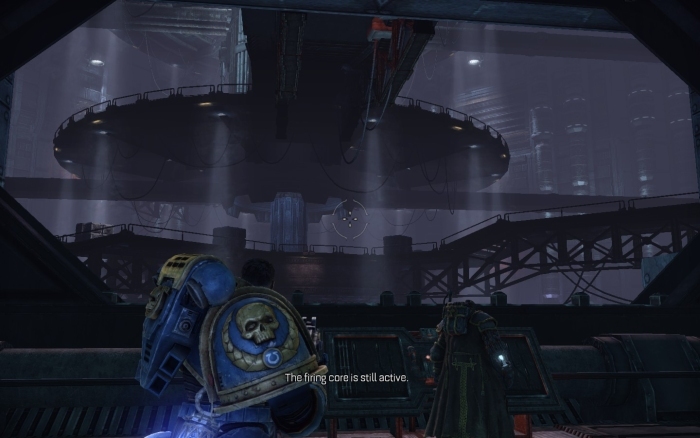 The Titan itself does nothing; it was just a moving platform that shifted under my feet annoyingly while I was trying to fight a bunch of Chaos psykers and flying machines that were flitting around near the hangar roof. Once I’d killed them all a tiny window opened at the end of the hangar and the Titan blew up the thing Captain Titus wanted it to blow up. There isn’t a single interesting thing about this encounter and it’s almost entirely down to the ambience and the environment. They made riding on a Titan boring. That’s not just lazy, that’s borderline criminal. People wonder why I get so upset when I hear a beloved old franchise like X-COM or Syndicate is going to get a 21st century “update” or a “reboot”. This is why. This game. It’s the result of somebody high-up at Games Workshop and/or Relic looking at Gears of War and how it’s been inspired by certain elements of 40K and gone on to sell millions of copies over several iterations, and thinking “Well, if they can make that sort of money without 40K, then surely we can make even more money with 40K! Genius!” And so we end up with Space Marine, a game which, based on the couple of hours I spent playing Gears of War before I gave up on it, is pretty much identical in terms of visuals and gameplay except that instead of generic space marines fighting some guys in big rubber orc costumes we’ve got actual Space Marines fighting actual space Orks. That’s the driving force behind modern game development; any creativity or risk-taking tends to be sidelined in favour of aping whatever game happens to be making money at the moment. And yes, it has ever been thus, and it’s not a phenomenon limited to video games, but it serves to illustrate the dichotomy between what the consumer wants (a fulfilling entertainment experience) and what the people who own the companies that make the games want (to make as much money as possible for as small an outlay as possible), and if the former gets in the way of the latter at all it’s getting chucked out of the window in favour of producing a game like Space Marine: an almost wholly drab experience where the fun parts are rationed out in miserly instalments which are far too brief in comparison to the large amount of time spent trudging through a series of monotonous grey corridors. I’d avoid it, if I were you.